Free week by week calendar for 2019 (one week on one sheet) for printing in pdf format. Country: United Kingdom (UK). You can download the file and print it on a printer. It can be used as a planner or notebook. 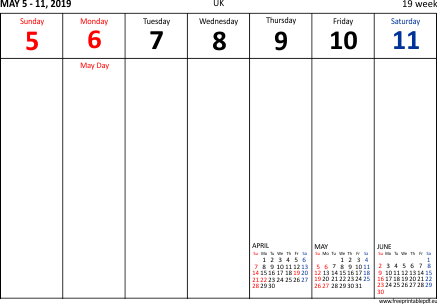 The week by week calendar contains 53 pages with the following information: day of the week, US federal holidays, week number, previous month, the current one and the following month. Blank places for your own notes.